When huge quantities of steels are delivered at construction site, initially, verify the test certificate of manufacturer for its genuine properties. With every lot of steel, manufacturer has to provide a test certificate of equivalent lot for conducting test at their laboratory. Verify the grade of steel stated in certificate and ensure it is according to the order or not. Steel bars may contain rusting on it, it should be verified properly that either it is allowable or not. The steel delivered on construction site does not contain any impurities like, mud, dust, oil and any other foreign material etc. Bars should not be broken and contain any other deformation on it. Primary steel formed with pure iron ore are prone to rusting quickly with regard to secondary steel. Rust may occur to bars because of getting in touch with water or air and atmospheric condition. Small amount of rust is preferred for bonding of steel and concrete. There should not be extreme scaling on the surface of bar. Make proper examination for steel brand, diameter and grade of steel imprinted on steel bars. Slit the samples of 1 meter in length, min 4 nos of bars from different bundles. Calculate the length of cut bars by taking measurements on minimum 4 sides and sum up to find out the average of length of bar. Take the weight the bar through weight scale and note it in register. Measure the actual average weight per meter of bar for minimum 3 samples. Tally the result of it with theoretical weight mentioned in IS 1786. Examine that the discrepancy in weight remains within limit or not according to IS specification. After getting the perfect results for nominal mass, proceed further to do bend test. Bend test should be carried out as specified in IS 1599 and using mandrels of size specified in IS 1786. Then, process it again to bend till 180 degree. At the construction site, bar bending machine with perfect size mandrel is used to bend the bar. Once the bar is bent, verify the surface of bar opposite to bend side (that got tension, elongated because of bending) for cracks and rupture detectable to a person with normal or rectified vision. 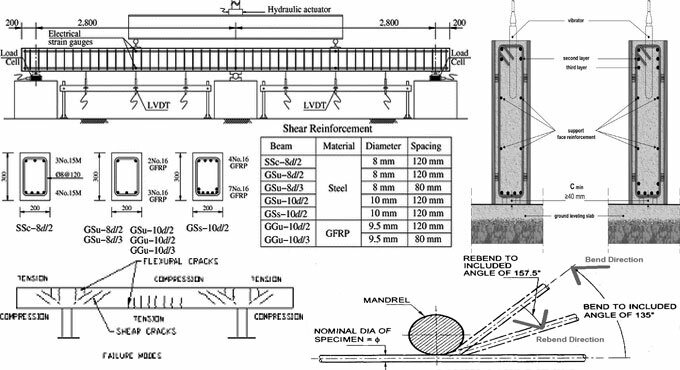 If rupture and cracks do not exist, rebar fulfills the requirement of bend test. Besides, a rebend test can also be performed at site, if necessary. (IS defines for executing but if it passes bend test, usually it will pass the rebend test also. It can also be performed if there is proper arrangement at site for this test).